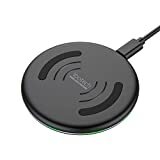 There are some products that we cover every time the go on sale because our readers love them so much, and the Yootech Fast Wireless Charger is one of them. It’s also one that sells out every single time we cover it. After all, what’s not to love about a $9 wireless charging pad that supports 7.5W fast wireless charging for iPhones and 10W fast wireless charging for Android phones? It’s back in stock right now on Amazon, but it definitely won’t be for long so grab one while you can!